Cream the sweeteners with the butter using a mixer. Add egg and flavorings. Mix until smooth. Add almond flour and stir until well mixed. Form dough into ¾ to 1 inch diameter balls (about 20-24) and space evenly on a parchment paper or silpat** covered cookie sheet. Place a small amount of granulated erythitol (or erythritol and splenda combo) in a small bowl. Take a glass and coat the bottom lightly with oil or non-stick spray. Dip the bottom of the glass in the bowl to coat it. Use the sweetener-covered glass to press down on each cookie ball to flatten it into a silver-dollar size. Re-dip the glass in the sweetener between cookies to recoat it. Take care to not make them too thin or they will brown too much. 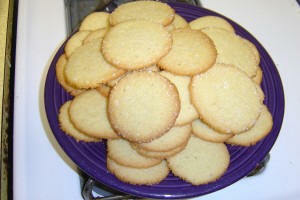 You can also sprinkle a little extra sweetener on the tops of the cookies once they are flattened if you’d like. Bake at 300°F for 16 minutes or until the edges of the cookies are very slightly browned. Remove the baking pan from the oven and let the cookies cool on the pan for 6 minutes. At this point, using a very flat pancake turner or spatula carefully remove each cookie to a wire rack. If they are still to fragile at this point, wait a few more minutes. Cool well on the wire rack. Once cooled, these cookies are crunchy and buttery. *granulated erythritol provides the crunchy crystals for the top of the cookie, but creates a cool mouth feel that some people find strange. Mix half and half with splenda to lessen that effect or leave it out if it bothers you. **Silpats are non-stick silicone baking mats. Parchment paper is available in most grocery stores near the foil. Use one or the other for most low-carb baking.